This fund allows us to be able to provide medical attention while the case is being investigated. RooBee is a Basset Hound that was found in a trash can with a broken leg and various other injuries. Denver is a Shar Pei mix that had skin issues. 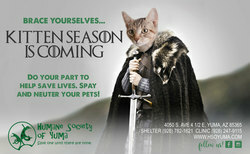 The Yuma community came through to help pay for their treatments until we could find them a forever home. Your donations can also assist us in putting together rewards when we need the public's help in finding suspects of animal cruelty. 4 Animal Cruelty Cases in the first quarter of 2016. The Humane Society of Yuma has seen a huge increase in the amount of cruelty cases that have entered our facility in the past 6 weeks. The largest case includes a hoarding case where 40 cats (of which 7 cats were pregnant) and 2 dogs were impounded due to the deplorable conditions they lived in within a 1000 square foot home. The Town of Wellton Animal Control gained entry and found copious amounts of feces throughout the house and an extremely strong smell of ammonia. Thankfully the animals have minor medical issues and are now in the care of the Humane Society of Yuma, where they are being housed, fed, and medically treated. The case is currently pending. The Humane Society of Yuma is also housing two Labrador Retrievers who was witnessed by an undercover police officer, being physically beaten by its' owner. The owner of these animals is currently in jail and the Yuma County Prosecutors Office along with the Sherriff's Department is investigating. Loba, an akita mix, whose lower jaw had to be removed due to lack of medical care after the dog had been allegedly injured while its lower jaw was stuck in a chain link fence, is also still in the care of the Humane Society of Yuma while her case is being heard in front of the court. Most recently is "Molly B." A yellow Shepard mix who was recently shot twice in the desert areas of Yuma County. "Molly B." is recovering well and is expected to make a full recovery very soon. The Sheriff's office is actively investigating this case. "Molly B." is very sweet but scared to death. We hope that once we are able to remove her drains she will be able to get on the road to recovery and eventually be placed in a forever loving home with no chance of going through anything like this again. Since the known owners of these animals have yet to release the animals into our care, the Humane Society of Yuma must delay the process of putting these animals up for adoption, therefore the costs of care are continuing to mount each and every day. "These animals need our help, and the Humane Society of Yuma needs the community's help right now. We are doing all we can to provide the best possible care to each one of the animals in our care. But impounding 45 additional animals, outside of the normal impounds we see, is a bit difficult. 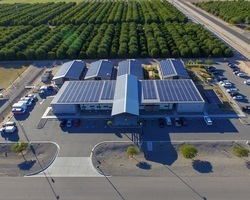 Not only are we seeing stressful space constraints, but the cost of care for each of these animals is considerable." - Lana Shapiro, Director of Development. "All of the funds collected from cases such as these will go directly into our Roobee's fund. This fund allows HSOY to care for victims of abuse when they enter the shelter, while also helping with outside medical costs for these animals when we can. Any money raised, but not used for these particular animals, will go back into the fund for future cases." On December 1st, 2015, the City of San Luis Animal Control, with help from the San Luis Police Department, removed a two year old, female, Husky with severe injuries. The injuries to this animal included a mass in her mouth the size of an orange. When the City of San Luis spoke with the owner, the owner stated that "Loba" had her mouth stuck in a chain link fence several months prior. Upon removal of the animal from the property, it was determined that "Loba" was clearly in a large amount of pain as she could not completely close her mouth and the mass was oozing and bloody. 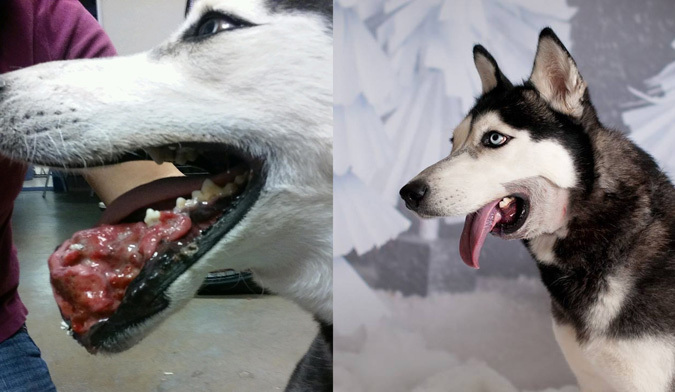 "Loba" was sent to a specialist where they removed more than half of her mandible, or lower jaw. Upon further investigation, it appears that "Loba" has cancer and it was never treated or tended to in a humane manner. Additionally, "Loba" was pregnant. The owner stated that once "Loba" had her puppies he had intended to euthanize her. The City of San Luis has charged "Loba's" owner with two felonies and two misdemeanors for animal cruelty. "Unfortunately, 'Loba' is one more case in our war against animal cruelty in Yuma County. 'Loba' went through unnecessary pain and suffering. Had the owner sought medical care for 'Loba' at the first sign of her having issues, 'Loba' would have endured a lot less pain and suffering" says Annette Lagunas, Executive Director of the Humane Society of Yuma. 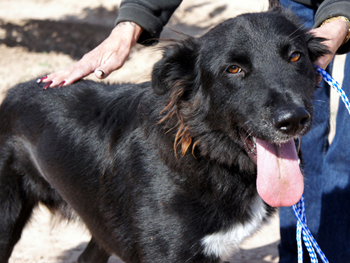 A. Lagunas continues, "'Loba' is in the loving care of a volunteer with the Humane Society of Yuma. Though we don't know what the future holds for 'Loba' because of the cancer she has been diagnosed with, we do know that the rest of her time here will be filled with nothing but love." San Luis Animal Control, with help from the San Luis Police Department, brought "Loba" to the Humane Society of Yuma after she was seized from the owner's property. "We are so grateful that the Animal Control Officers and the Police Department in San Luis were very active in getting 'Loba' away from her owners and into our care. We are honored to help the San Luis Police Department see that 'Loba' gets the absolute best care she can until the end of her stay with us. In addition to ensuring she is well cared for, HSOY staff and volunteers will be in each of 'Loba's' court cases hoping to be seen as a voice for her" - A. Lagunas. Animals such as "Loba" enter HSOY all too often. To help other animals just like "Loba" donate today to HSOY's cruelty fund. 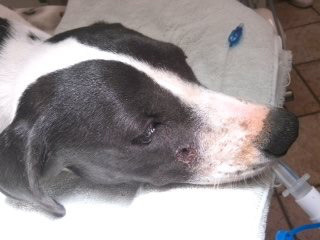 Gunshot to dog's face. 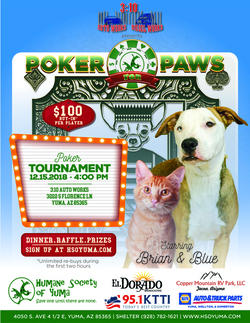 Raising funds for the aftercare and comfort of Brady in cooperation with the Yuma County Sheriff's Office. Brady has received extensive surgery and will require a lenghty and comprehensive recovery period with specialized medical attention. HSOY will be providing the funding for the aftercare and comfort for Brady until she is adopted into a loving home. Anyone with information regarding this case, please contact Sgt. Scott Bjornstad at the Yuma County Sheriff’s Office at 928-783-4427 or 78-CRIME to remain anonymous. You can also visit our website at www.yumacountysheriff.org to submit an anonymous tip. Sunday, August 23rd, 2015 two kids witnessed a light colored pick-up truck dump two dogs on the side of the road. One ran away immediately, while the other was too sick and injured to run. The two witnesses, stopped to inquire about the animal that had stayed behind, only to find a male poodle mix to be severely matted, covered in ticks, and injured. The dog was brought to a Humane Society of Yuma supporter who cared for the animal overnight, but then was immediately brought to the HSOY this morning for care and animal control was notified. After a deeper examination and emergency care, the dog’s red blood cell count was determined to be very low and is under heightened supervision. Currently, the plan of action is to keep Rascal (named by the caring volunteers who rescued him) and evaluate his medical issues. Long-term care will be required for Rascal. HSOY has solicited the help from a local Veterinarian and staff to care for Rascal’s medical needs and advanced care. At this point Rascals future is unknown, but one thing is certain, Rascal is receiving the best possible care and love, something Rascal hasn’t seen in quite sometime. HSOY is asking for the community’s assistance for the care and comfort of this special soul. You can donate to RooBee’s Cruelty and Denver’s Medical Fund from this page. This fund is dedicated to assist with the medical expenses associated with cruelty cases, such as Rascal’s case. 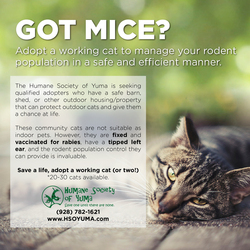 The Humane Society of Yuma cannot accomplish its mission without the support of the Yuma community. Donating to this fund will directly impact Rascal’s opportunity to recover and find a new loving home in addition to many more that may come in after Rascal. A stray we named Hunter came to our shelter with a crippled hind leg that needed veterinary attention. Thanks to the kindness of Dr. Cheryl Huago of Desert Vet, the necessary care was provided at a discount. Yet funds are still needed to settle the remainder of the bill and to ensure that we can continue to provide care for dogs, like Hunter, who come to us in need of medical attention. Below is Director of Operations Annette Lagunas' personal appeal for contributions to our Roo Bee's Cruelty & Denver Medical Fund to help provide the treatment that Hunter and animals like Hunter need to go on to live the happy and fulfilling lives they deserve. "Hunter came into us limping. After much thought and deliberation, it was said that Hunter needed to beeuthanized because of his limping and the amount of resources that would be necessary to fix him. Imade the decision but wanted to meet him and spend some time with him before the final decision was made. As I sat with him in the dog play area he ran around like a wild child. I sat up against the fence and he came at me full speed and practically jumped right into my lap. He would grab my hand with his mouth almost to say get up and play with me. I called my friend Dr. Cheryl Haugo and spoke to her about Hunter. She agreed to assist with doing the surgery and help with his medical bills. Of course she cannot cover his bill completely but she could help out. Dr. Haugo has staff and overhead that she also needs to pay. Dr. Haugo took a look at Hunter and x-rayed his knee. It was found that he had problems with his left knee and itneeded a surgical procedure to fix.